Today when we think of the word followers, our mind quickly takes us to Twitter. As in, “How many Twitter followers do you have?” Instagram, Pinterest, and Google+ also lists our number of followers. And when someone wonders about the number of our friends, it’s often a reference to Facebook. (Goodreads, has friends too, as well as followers). Other social media platforms use different terms to describe the same concept. In addition to followers and friends, we have likes (also Facebook), connections (LinkedIn), and subscribers (YouTube and our blogs). For my own social media sites, my total number of followers, friends, connections, and subscribers totals over 20,000. That may be more than you have or less. But this number pales when compared to popular people whose numbers are in the millions. However, my 20,000 is misleading. Though I don’t need to say it, I will. I don’t know each one of those 20,000 people. It might be 500 of them whose names I recognize. And the number grows smaller for those who I know something about. Though more telling, however, is the number of people who I’ve had two-way interactions with online in the past week. And even more convicting is the number of people who I’ve had in-person interaction with in the last seven days. Despite how the internet connects us instantly with anyone around the world, the number of meaningful interactions I’ve had with people (either online or in person) in the past week is quite small. It might be twenty or so, which is 0.1 percent of my so-called followers and friends. We need to reclaim what it means to be a follower and a friend. To understand what it really means to be a follower, let’s go back to the Bible. 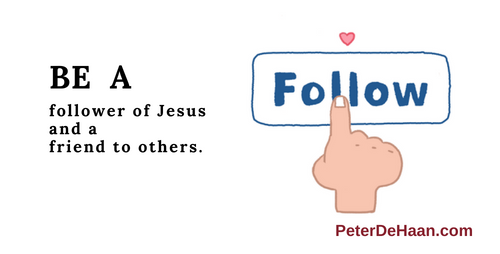 Jesus encouraged people to follow him. He said “follow me” twenty-two times, with Matthew 4:29 being the first of many occasions. We need to be a follower of Jesus. And Paul—as audacious as it seems—encourages people to follow him, as he follows Jesus (1 Corinthians 11:1). Today, we can follow someone with a click of a button and immediately forget that we did it. However, in the New Testament, to be a follower of Jesus was a serious commitment. For Jews who follow Jesus it meant being kicked out of the synagogues and rejected by their subculture. For non-Jews—that would be Gentiles—it meant embracing a lifestyle foreign to everyone you knew. At best they would ignore you or not do business with you. At worse, it meant rejection and isolation. And throughout the centuries, following Jesus has often resulted in death. Being a follower of Jesus is a costly commitment; we shouldn’t pursue it without careful consideration. This is much unlike today’s easy-click following of someone on social media. I’m not saying we shouldn’t follow people online. I am saying that when we follow Jesus we must take it very seriously, because it is. Following Jesus is a lifelong commitment, with real life ramifications. Just as it’s easy to have followers online, it’s easy to have friends there, too. But many people, for all their online friends, are lonely. This is sad. How can we have friends and still be lonely? Proverbs talks about a friend who is closer than a brother, Proverbs 18:24. This starts to get to the true meaning of friendship. And there’s Jesus. Jesus was accused of being a friend of sinners, Matthew 11:19 and Luke 7:34. Though his detractors meant this as a slur, it’s really a sign of character. A true friend isn’t someone that you exchange likes, shares, and comments with on Facebook. A true friend is someone you can call at any time, and they’ll be there for you, doing whatever they can to help. Don’t seek followers and friends online. Instead be a true follower of Jesus and a true friend to others. This is what being a follower and a friend truly means.